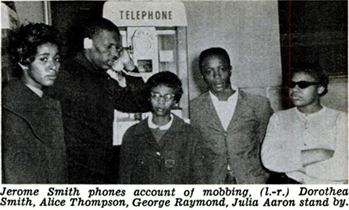 This is a 1961 photo of New Orleans CORE members (left to right) Doratha Smith, Jerome Smith, Alice Thompson, George Raymond and Julia Aaron. The photo was taken soon after they had just received a beating by a White mob in McComb, Mississippi while doing integration testing at the local Greyhound bus station. This photo is shown to illustrate just how physically small Alice Thompson (21 at the time) was, just like her sisters Jean and Shirley. None of the Thompson sisters were said to weigh more than a hundred pounds. 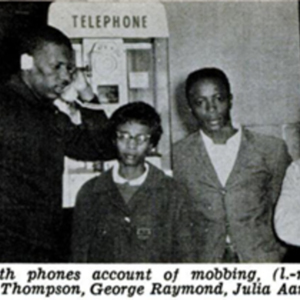 “photo of Alice Thompson with Doratha Smith, Jerome Smith, , George Raymond, Julia Aaron, New Orleans CORE,” The CORE Project, accessed April 24, 2019, http://www.thecoreproject.org/omeka/items/show/73.